Sorry if the title is misleading. These are pictures from the super awesome time I spent in and around NYC after the Bash. I met up with my sister and we got out to Ellis Island to watch my cousin as the lead actor in a play about immigrants. He did an incredible Bela Lugosi and really brought out the emotion in the character. We got to the Museum of Natural History and had an agenda. We'd both been there as kids. It left a huge impression because we both knew exactly what we wanted to see - the gems and the Big Blue Whale. My whale pics didn't come out very well. You know how things always seem bigger when you are a kid, but don't live up to your expectations when you see them again as an adult? Yeah - not so much this whale. This thing is still friggin' huge! This one is just for me and my sis. 17 Mott Street is the home of Wo Hop. Our Dad brought us here and would go on and on about their special soup. With good reason. That and the crispy noodles was probably the highlight of my trip. I'd swear the spirit of my dad and uncle were there with us. We toasted them with our glasses of hot tea and truly lived in the moment. 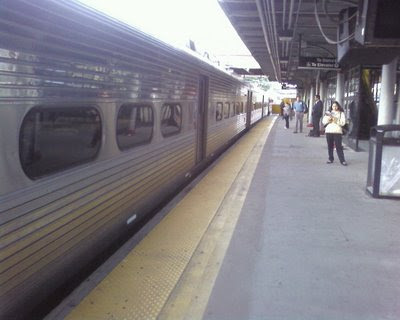 Here's the NJ Transit train that took me to Penn Station. I'm embarrassed to say that when I was coming back to NJ, I was standing right in front of Madison Square Garden asking random hot dog vendors how to get to Penn Station (for those who don't know, it's directly under the Garden). After the show, my sister , my cousin and I walked across the Brooklyn Bridge to Grimaldi's Pizza, one of (if not THE) oldest pizza places in the city. Nothing beats NY pizza, and I'd put Grimaldi's up against just about anything. The line out the door spoke for itself. A close up of your hero and his family taken from the bridge with the Empire State Building in the background. Doc - you were in my neck of the woods! One of the simple pleasures I always recommend for visitors is the trek across the bridge and pizza at Grimaldi's. The ice cream at the Brooklyn Ice Cream Factory is very good too. Hopefully I'll make it to Vegas in December - will be sweet to hang out with you and the wife again. Only, I don't want you seated to my left in the blogger tourney! We totally went to the Ice Cream factory right after the pizza! One of my favorite memories of New York was a little italian restaraunt on the island named "Leonardo's" and the occasional visit with my grandfather to eat at the South Street Seaport.